-	Spend $900 and receive a $300 Canadian Tire Gift Card. 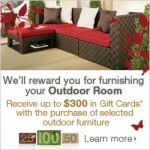 The Canadian Tire gift card promotion for patio furniture is an attractive incentive. Actually getting the card is a bit of a hassle, but definitely worth the time and effort. To receive the rebate you must buy the patio furniture before the expiry date and send in a mail in rebate [PDF] before June 22nd, 2009. Not as easy as the cashier handing you your card, but if you are looking for patio furniture you may was well get a big Canadian Tire gift card with it. Even if you do not usually shop at Canadian Tire you can always get cash for your gift card by selling it on Giftah.